I didn't pair these two books together on purpose, and sometimes those pairings are the most exciting and moving. Both of these books are about small communities where everyone knows everyone else’s business and secrets are hard to keep, where beliefs are held tight and one wrong move can ruin a person for a lifetime. Neither of these books are easy reads—the subject matter can be painful and graphic—but I feel they are both ultimately hopeful and important. I had been hearing a lot of good things about The Book of Essie by Meghan Maclean Weir and when I picked it up, I immediately knew why. Essie is a great character—smart, driven and headstrong. Despite growing up on a TV reality show, “Six for Hicks” as the youngest daughter of a celebrity preacher father, she knows what she wants and she’s willing to do anything to get there. We learn in the first sentence that Essie is seventeen and pregnant, a major problem for both her family and the producers of the reality show. I was definitely compelled to figure out who the father was, how Essie and her family would handle the situation, and what would become of the Hicks family moving forward. Essie’s story alternates with that of Roarke Richards, a senior at her high school whom Essie ropes into the mess, and Liberty Bell, a conservative reporter whom Essie hires to tell her story. Though each of these characters have complex histories and buried secrets of their own, I felt their stories weren’t as completely fleshed out as Essie’s. I could have used a few more pages from each of them to give me a better sense of their motivations and how their journeys parallel that of Essie. This is one of the books where the setting becomes a character. The evangelical Christian community in this small midwestern town looms large and controls everything. Essie’s mother is not only the matriarch of her family, but of the entire town, fully aware of the goings on in every household. I wasn't surprised to learn that Weir grew up in the rectory of her father’s church—her words made this world come alive in all its fascinating and dark complexity. A fellow physician novelist, I will follow Weir closely to see what she writes next. Beartown has been on my TBR list since it came out. I loved A Man Called Ove, but for some reason, this one wasn’t calling to be until I saw it was available as an audiobook from my library. I checked it out and listened on my commute to work. Though completely different from his earlier work, I did enjoy this one as well. This story centers on Beartown, a small community in the the frozen forest of Sweden. Instead of evangelical Christianity, the people of Beartown worship the gods of hockey. Everything in Beartown revolves around the game, the players, and the team record. Those who don’t play or coach or manage still follow the team with a religious fervor. The players are revered and protected above all else. 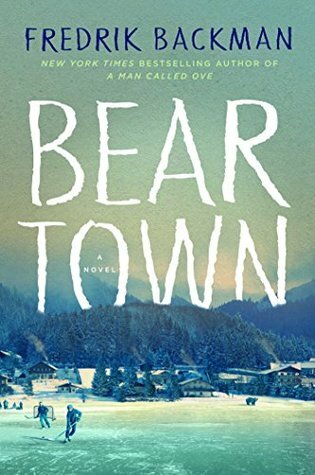 When the star player makes a horrible mistake leaving a fifteen year old gurl forever traumatized, the people of Beartown are forced to takes sides and show who they really are and how far they will go for the sake of the team. Backman used quickly shifting third person narration to tell the story of the entire town and to show the reader multiple different sides of the story. He deftly switches from one character to another sometimes several times on the same page. Though it could feel a bit fragmented at times, I did get used to this technique and appreciated the way the shifting perspectives gave a 360 degree view of Beartown. The narrator, Marin Ireland, did a wonderful job creating different voices for the characters and bringing them to life.